It's a lazy supper tonight. Lazy but one of our favourites. Pesto with pasta. My children won't eat the ready-made stuff you can buy in a jar but they LOVE my homemade pesto. To be honest, I don't think you can really compare the two - fresh pesto is a hundred times nicer and nutritionally far superior*. It's shamefully easy and, as I was about to make it this afternoon (and it was still daylight), I thought I'd share it with you. Two handfuls of basil (stalks too). A matchbox-sized square of Parmesan cheese. A small handful of pine nuts. 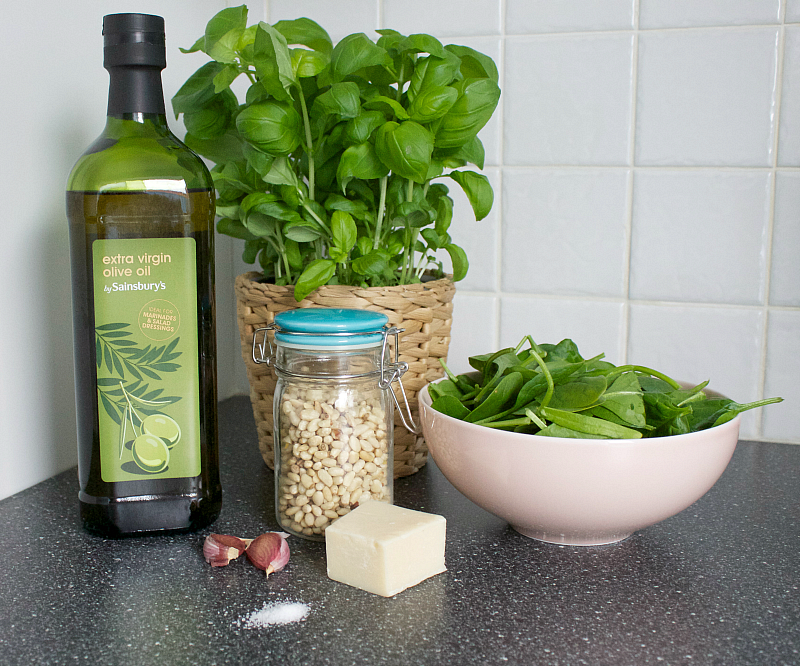 Extra virgin olive oil (possibly a cup full - add gradually until pesto is the right consistency). A generous pinch of salt (to taste). Whizz all the ingredients together in a food processor. Wrapped carefully, it will sit quite happily in your fridge for up to a week. 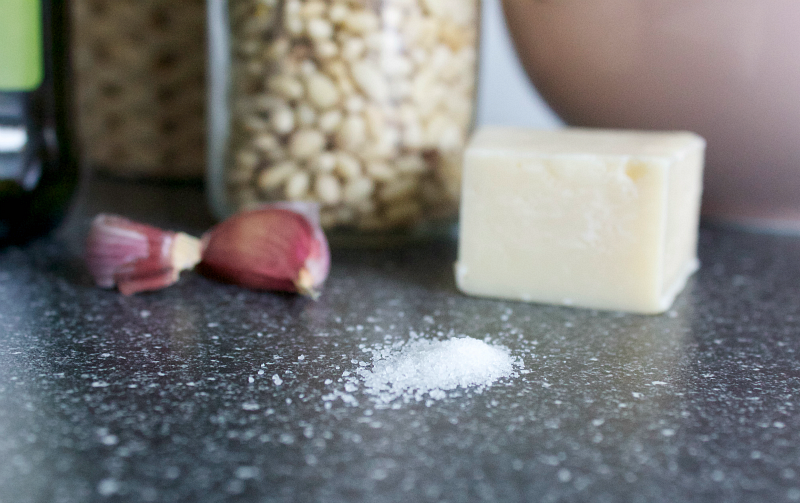 Each person only really needs a heaped dessert spoonful to stir through a bowl of steaming pasta - it's beautifully fragrant and a little goes a long way. I don't just use my pesto in pasta - it's fabulous with chicken, baked potatoes, bruschettas and a small dollop in tomato soup is delicious. *I think I've mentioned basil's powerful anti-depressant properties before - a must, in my book, for this time of year. You can, of course, vary the ingredients for a slightly different flavour; I've used watercress and rocket instead of basil and spinach and have even added a few frozen peas for a sweeter taste. I've also replaced the pine nuts with walnuts. All combinations are equally as yumptious! Ooh yum! I'm pinning this for future reference! Me too, vegan pesto for me! My children love pasta with pesto, but I haven't made homemade for years. Must try! Btw, where did you get your little jar for the pine nuts? I love it! Oh I love pesto, I can't imagine how good homemade stuff is, if jar pesto is good! 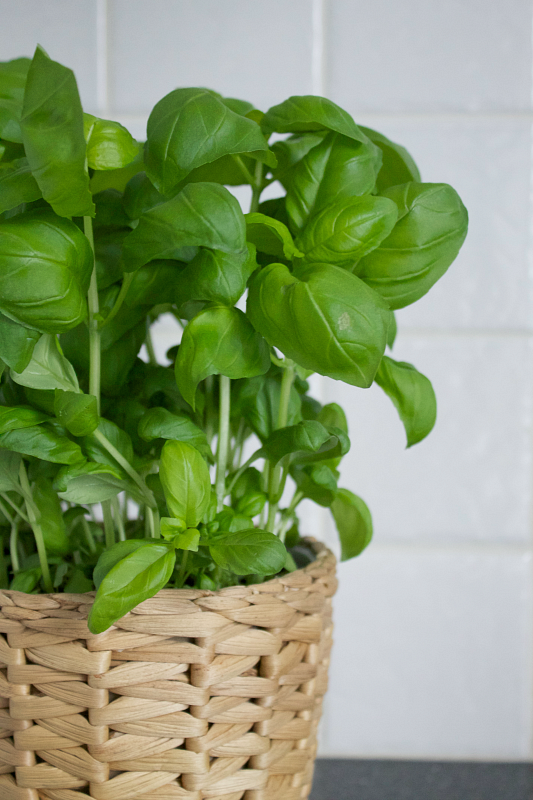 Just bought a basil plant today so guess what I will be making! I love making pesto as I blitz it in a biggish spice mill or have even done it with my handblender. Originally I bought a pestle and mortar as Antonio Carluccio said it was imperative to the flavour (!) and what a stringy mess I got, far better to blitz it in seconds. I agree with your kids -why eat jarred stuff with peanuts, dodgy oil and vinegar to ruin the flavour. I don't add salt but that's probably because I get the saltiness from using half parmesan and half pecorino romano. I have had a deli version made with wild garlic and should try it making it with watercress etc but the original is just so tasty! Mm mm yummy I can smell the basil from here! I totally agree, I love pesto and I love making my own. 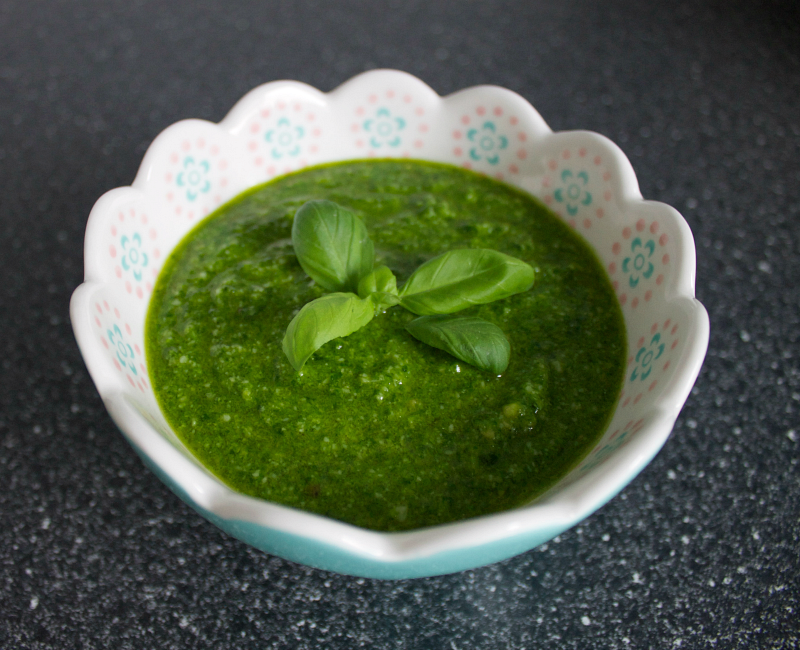 Have you ever tried making the wild garlic/ransomes version ... it's divine. Years ago I tried some pesto from a jar, and it was pretty bad, so I just figured pesto wasn't my thing. However, after reading this post, even though it's still winter here, I decided I had to find enough basil to try making my own. I found it in just the right amount (and it didn't break the bank) and made it and all I can say is WOW. Talk about addictive! I followed your recipe mostly, although I only had shaved parmesan and crushed garlic in a jar, next time I'll make sure I have good garlic cloves and a chunk of parmesan - no matter, it was still wonderful. My son and I have eaten nearly all of it in the last few days. A little pasta here, a little pasta there, a bit on a frittata I made, mixed in with some marinated cucumbers, yum yum and yum. Now I'm looking even more forward to late spring so I can plant some basil and have this on hand. Thanks so much for sharing.